This is your narrative “tour guide” as you sail north from the Verrazano Narrows Bridge to the George Washington Bridge. Note 1 – This is page is active; it will be continuously updated. As you sail north, from the Lower Bay through The Narrows, Fort Hamilton (Brooklyn) is on your right while Fort Wadsworth (Staten Island) is on your left. As you pass under the bridge, through The Narrows, straight ahead is Anchorage Channel, an extension of Ambrose Channel. The Verrazano Narrows bridge connects the boroughs of Staten Island and Brooklyn. It is named for Giovanni da Verrazano, the first known European navigator to enter New York Harbor and the Hudson River, and for the body of water it spans, The Narrows. It has a center span of 4,260 feet and was the longest suspension bridge in the world at the time of its completion in 1964. Since 1976 it is the starting point for the New York City Marathon. Looking off to the distance on your left, you will see the St. George Ferry Terminal for the Staten Island Ferry. The land at the “horizon” is Bayonne, New Jersey. In the foreground you will see the Robbins Reef Lighthouse (sparkplug style), which is just off Constable Hook (Bayonne) and at the entrance to the Kill Van Kull, which connects to Newark Bay. Just north is the Military Ocean Terminal in Bayonne, which served the US Navy in World War II, including the production of 400 Elco PT boats, including the PT 109, on which the future President John F. Kennedy served in World War II. Amongst its uses today, it serves as the Cape Liberty (Cruise) Ship Port. As you look north and west, you see the unmistakable Statue Of Liberty (Liberty Enlightening the World [a Liberté éclairant le monde]). Shift back to the eastern shore and as you travel north, Bay Ridge, Brooklyn (New York) is on the rightmost coast. The pier you see is the American Veterans Memorial Pier (fka., the 69th Street Pier), which is just off of Owl’s Head Park. The large facility north of the pier is the Owls Head Water Pollution Control Plant, which went into service in 1952. Just next to the Water Pollution Control Plant is the Bay Ridge Rail Yard (also known as the 65th Street Rail Yard) in Bay Ridge, Brooklyn. Freight cars are moved by car float from New Jersey railroad terminals to the Bay Ridge terminal. Next to the rail yard is the Brooklyn Army Terminal, followed by the 58th Street Pier. As you hug Brooklyn, you are sailing in the Bay Ridge Channel, which leads you to Gowanus Bay and to the Red Hook Channel. The Red Hook Channel leads you around Red Hook, Brooklyn, and to either Buttermilk Channel (between Governors Island to the west and Red Hook to the east) or back to Anchorage Channel. As you hug Brooklyn, you’ll find the Atlantic Basin and the Brooklyn Cruise Ship Terminal. Keep traveling through Buttermilk Channel and you’ll see Fort Jay, on the northeast side of Governors Island. The whitestone, octagonal structure is an air vent for the Brooklyn-Battery tunnel. If you head west from the Red Hook Channel, away from Red Hook, you will be south of Governors Island and reconnecting back to Anchorage Channel. As you hug Governors Island and head north, on the northwest side, you will see Castle Williams. Heading back toward the Statue of Liberty, the land behind the Statue is Liberty State Park, New Jersey’s largest urban park, located in Jersey City, New Jersey. Just north of the Statue is Ellis Island, the famed point of immigration arrivals of 12 million steamship passengers, from 1892-1954. North of Ellis Island, the brick structure is the Central Railroad of New Jersey Terminal, built in what was known as Communipaw Cove. Just north of the railroad terminal is Morris Canal, which once reached through New Jersey to Phillipsburg, New Jersey, on the Delaware River (which separates New Jersey and Pennsylvania). On the northern edge of Morris Canal, the 42 floor (781 foot) building is Goldman Sachs Tower, 30 Hudson Street, the tallest building in New Jersey. The Colgate clock, 50 feet in diameter, has been moved about the Jersey City coast, but dates back to 1924, which succeeded an earlier clock. The current location, at Exchange Place, is 400 meters south of the former Jersey City headquarters of Colgate-Palmolive. Swing back to the east side of the Hudson River, and just off the northeast tip of Governors Island, you head into the East River, and you will then see Brooklyn Heights, and in the foreground, Brooklyn Bridge Park (under construction, in stages), which leads up to the Brooklyn Bridge. Beyond the Brooklyn Bridge is the Manhattan Bridge and then the Williamsburg Bridge. Where the East River and Hudson River “merge,” the cross-currents are referred to as “the Spider,” especially in the first two hours of the East River flood, while the Hudson River is still ebbing (and vice versa in the first 1.5 hours of East River ebb and Hudson River flood). The tip of Manhattan is The Battery. Here you will find the Battery Maritime Building and the Whitehall Terminal, which serves the Staten Island Ferry. The ferry to The Statue of Liberty and Ellis Island leave from Castle Clinton. The first pier you see, with the clock tower is Battery Park Pier A. Moving north the hexagonal building, in the Robert F. Wagner, Jr. Park, is the Museum of Jewish Heritage: A Living Memorial to the Holocaust. Moving north, through Battery Park City, you reach North Cove, and World Financial Center. Three World Financial Center (200 Vesey Street) has the pyramid roof and houses the offices of American Express, and is the tallest of the World Financial Center buildings. The glass atrium is the Winter Garden, and behind these buildings stood the World Trade Center. 7 World Trade Center has been rebuilt and 1 World Trade (fka, The Freedom Tower) is under construction. Nelson A. Rockefeller Park is the last section of Battery Park City. Heading north, once Battery Park concludes, Hudson River Park begins, which runs up the west side to 59th Street. The two glass, just about “transparent,”16-story towers 16 story were designed by Richard Meier and are located t the north and south corners of Perry and West Street in the West Village. The third glass tower, just to the south, at 165 Charles Street, was also designed by Richard Meier, but was built and developed separately. Just around the corner, on West 11th Street, is Julian Schnabel’s Palazzo Chupi five unit condo – the pink, neo-Mediterranean building built on the top of an old stable (see more in Marine/Sail Stories/Articles). The tan brick structure, on Pier 34 is the Holland Tunnel ventilator shaft. The “twisted” office building (West 18th Street) was designed by Frank Gehry for InterActive Corporation (IAC). Just north of this building, the curved high-rise, of many rectangles, is the residential building 100 11th Avenue, designed by Jean Nouvel. Moving north, the blue buildings, including the pier with the “giant net’ comprise Chelsea Piers Sports and Entertainment Complex (Piers 59, 60, and 61), which were formerly luxury liner passenger ship terminals. Traveling north, the long, blackened glass structure is the I.M. Pei designed Senator Jacob Javits Convention Center (34th -38th Streets). Further north, the aircraft carrier is the USS Intrepid, which is the anchor (no pun intended) of the Intrepid Air, Sea, and Space Museum (Pier 86 at 46th Street). Just north of the Intrepid are the New York City Passenger Cruise Ship Terminals (between 48th and 52nd Streets). The large green “shed,” north of the cruise ship piers, is a New York City Sanitation Facility (59th Street), which is about the end of Hudson River Park and the beginning of Riverside Park South. Note that just about every Hudson River Park pier is described further in the “Hudson River Park” Category in this blog/website. Looking back to New Jersey, and the stretch of Jersey City from the Colgate clock, the long, but “short” building is Harborside Financial Center. Followed by the Hyatt Hotel, located on the Harborside Financial Center’s south pier. Various residential and commercial high rises take you north, past Newport Marina and the Pavonia/Newport PATH station (not readily visible from the water). Just north, in tan brick, you will see the other Holland Tunnel ventilator shaft. Jersey City then ends and Hoboken begins, just north of the ventilator shaft. Note the Hoboken Rail Terminal, constructed in 1907 as the Delaware, Lackawanna and Western Railroad. Today, it serves mostly New Jersey Transit commuter trains and buses, the PATH train, and ferries to New York City. North of the station, atop the hill (Castle Point) is part of Stevens Institute of Technology. The tall building is Wesley J. Howe Center, occupying the site of the former “Stevens Castle” on Castle Point. Just next to Castle Point is the Union Dry Dock Company (shipyard). Moving north, after Hoboken is the town of Weekhawken. Weekhawken is home to Port Imperial and Lincoln Harbor. The restaurant you see on the pier is The Chart House. The elevated helix you see is the ramp to/from the Lincoln Tunnel, between New Jersey and New York. The dark brick structure is the ventilator shaft of the Lincoln Tunnel. Following north, after Weekhawken is West New York (New Jersey), Guttenberg, and Edgewater. The large Hess fuel tanks are in Edgewater. Fort Lee is the next town, leading up to and including the George Washington Bridge. Turning back to Manhattan, and about 59th Street, so begins Riverside Park South. If you are looking for Pier D (64th Street), the twisted mass of iron that served as a loading and unloading site for New York Central Railroad boxcars from barges, it was removed in January 2011, due to concerns of its eventual collapse into the Hudson River. Remaining, though, is the 69th Street Transfer Bridge, which was part of the West Side Line of the New York Central Railroad, and was a dock for car floats which allowed the transfer of railroad cars from the rail line to car floats which crossed the Hudson River to the Weehawken Yards in New Jersey. North of the 69th Street Transfer Bridge is the 79th Street Boat Basin. And set back, and north of the boat basin is the Soldiers and Sailors Monument, which commemorates Union Army soldiers and sailors who served in the American Civil War (89th Street). This should not be confused with Grant’s Tomb (Ulysses S. Grant [1822–1885], American Civil War General and 18th President of the United States, and his wife, Julia Dent Grant [1826–1902]), at 122nd Street in Riverside Park at Morningside Heights. Just about next to Grant’s Tomb is Riverside Church, The Riverside Church located on Riverside Drive and 120th Street near Columbia University, where Harlem and the Upper West Side meet. Further up, the large structure on the water is Riverbank State Park, which is atop the North River Wastewater Treatment Plant (137th – 145th Streets). Glance northward, and you see the George Washington Bridge, and the Little Red Lighthouse on Jeffrey’s Hook. The Little Red Lighthouse originally was built on Sandy Hook, New Jersey. The George Washington Bridge opened to traffic on October 25, 1931. The Bridge is near the sites of Fort Washington (on the New York side) and Fort Lee (in New Jersey), which were fortified positions used by General Washington and his American forces in his unsuccessful attempt to deter the British occupation of New York City in 1776 during the American Revolutionary War. Note 2 – Some descriptive phrases herein may be sourced from other websites (e.g., Wikipedia). The respective reference’s link is attributed elsewhere in this blog/website. monument stands on a rebuilt stone breakwater in the harbor. 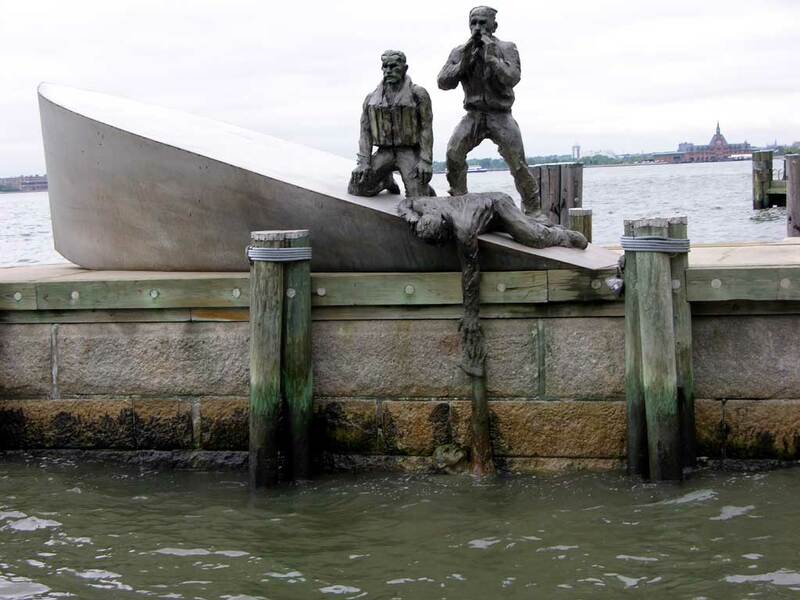 The bronze figural group and boat are based on an actual historical event; during World War II, a Nazi U-boat attacked a merchant marine vessel, and while the mariners clung to their sinking vessel, the Germans photographed their victims. Tagged with American Merchant Mariners' Memorial, Colgate clock, Colgate clock Jersey City, Earthcam, East Coast Memorial, Ellis Island, Empire State building lights, Empire State Building Tower Lights Calendar, Empty Sky (9/11Memorial), General Grant National Memorial, Grant's Tomb, Henry Hudson Monument, Hoffman Island, Interior of Soldiers and Sailors’ Monument Remains a Hidden Jewel, Lights on the Empire State Building, Riverside Park, Soldiers' and Sailors' Monument, Soldiers' and Sailors' Monument (New York) from Riverside Park, Statue of Liberty, Statue of Liberty Earthcam, Swinburne Island, Tear Drop Memorial, Tear of Grief, To the Struggle Against World Terrorism, What color is the Empire State building?